You will truly love this addition to our collection of Insperational designs. 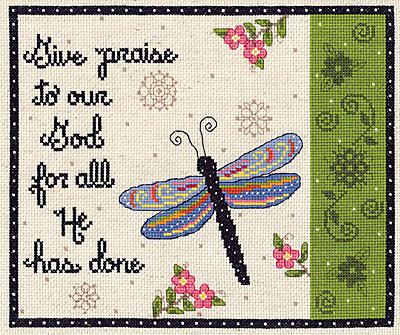 "Give praise to our God for all He has done" is beautiful and colorful counted cross stitch design. Contains: 14-count Aida fabric, 6 strand 100% cotton floss, needle, graph, instructions. Size10" x 8"